Having been blogging for around a month now I thought I’d jot down a quick post to reflect on how it’s been. I started this blog primarily as a place to commit my thoughts to page without needing to be constrained by the more professional and impersonal nature of article writing. When writing articles I am generally far more rigorous with editing, going through several drafts and sharing them with people before publication for feedback. Blogging by contrast feels quite liberating, being able to put metaphorical pen to paper and quickly bash out my thoughts on an issue and publish them on the same day. Indeed some of my posts, specifically my most recent on the battle of ideas, started out life as article pieces but having neglected to take them through my usual process of review I took the opportunity to publish them anyway. Its worth thinking about what the value of all this writing is though. Generally when doing political activity I try to be as pragmatic as possible, doing what I feel is necessary and most useful politically rather than simply what I personally enjoy or find rewarding. This makes blogging something of a guilty pleasure. My blog has a tiny audience, slightly expanded by the fact I’ve been cross-posting on Anarchist Writers (somewhat cheekily, given I don’t identify as an anarchist), and doesn’t form part of a strategy to influence the thinking of the left, at whom most of my posts seem to be aimed. In short, the time I spent blogging I feel could be better spent on other, less enjoyable things. 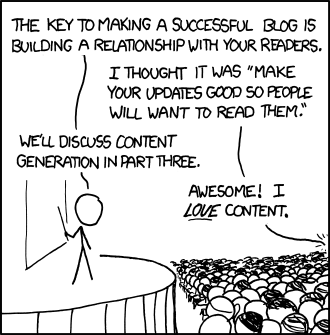 That noted, there are certainly some useful functions of blogging. First and foremost this blog is a handy archive where I can stick things I’ve written for various places for easy access later. Secondly the process of blogging is usually one of trying to express ideas and analysis I’ve been batting around in my head for a while, and attempting to form a written argument helps to show up contradictions in my thinking and to clarify in my own mind exactly what it is I do think. On the other hand this can be a double edged sword as having committed to one viewpoint publicly I am more likely to stick to it and defend it, becoming a little more close-minded in the process. 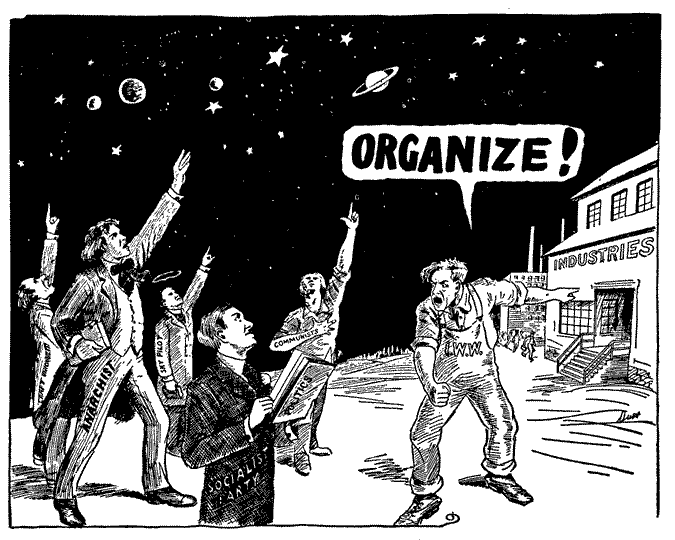 I like this cartoon because it largely sums up my feelings about the left, there needs to be less fannying around, and more organising (I also find the inclusion of a “sky pilot” in the background inexplicably hilarious). But my blog has pretty much entirely been fannying around, tellingly the biggest tag within my tag cloud is presently “political theory”, a subject which dominates this blog, despite my professed distaste for navel-gazing. I hope this to be only a temporary phase, after all I have been active as a socialist far longer than I have been active within the labour movement and so naturally have accumulated more thoughts with regards to the former. Adittionally undoubtedly part of the drive behind various posts has been wanting to sum up my feelings on particular debates I’ve been involved in, often over at the Anarchist Black Cat forums. Sadly these debates tend to be more on questions of political theory than organising strategy and tactics. Perhaps unsurprisingly then this blog is in some ways a reflection of the debates within which I am participating, which in turn are determined by the place the movement I am within is at. That said, having now put most of my thoughts on more abstract political theory down somewhere I now hope to move on to posts more concerned with what I believe is paramount, the labour movement, its problems, their solutions and the strategies that I believe can help build it into a movement capable of winning socialism. This entry was posted in Uncategorized and tagged Blogging, This blog. Bookmark the permalink.